Tributes have been paid to a “hardworking, honest and reliable family builder” from Shepperton who died after a fall at work. 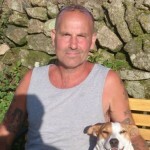 Mick Fisher, 52, died suddenly on Monday April 14 after falling from a ladder while working in Whitton. The builder of 35 years has been described by his wife Jane as a “loving dad” and a “wonderful loving husband”. Mr Fisher’s funeral was held on Tuesday May 6 at 2.40pm at Hanworth crematorium. Lodge Brothers Funeral Directors in Shepperton handled donations in his name to the NSPCC via their website.